Retractable ID name badge holder reels are a great way to add color to your day. 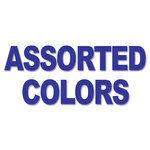 Order color assortments to add variety or to match outfits or holiday color schemes. These affordable ID badge holders are available in 8 cool reel colors.